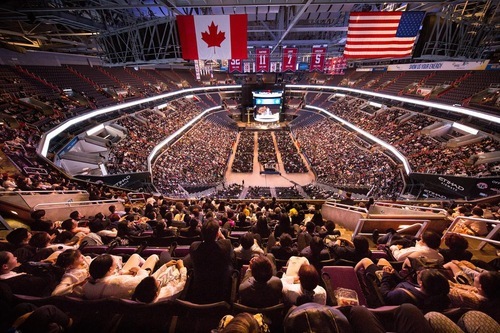 Nearly ten thousand practitioners from 56 countries and areas attended the 2018 Falun Dafa Cultivation Experience Sharing Conference held at the Capital One Arena in Washington DC on Thursday, June 21, 2018. 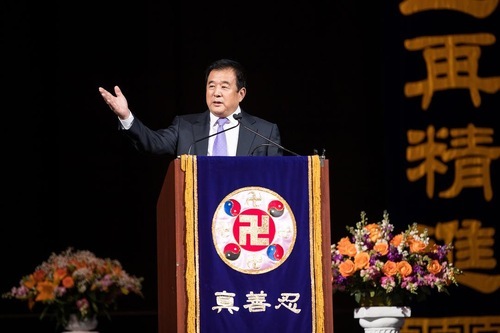 Master Li Hongzhi arrived at the conference at 2:00 p.m., and lectured for one hour and 45 minutes, including a question and answer session. Attendees applauded warmly to welcome the revered Master. Master Li Hongzhi greets the attendees. Justly setting all things right. Sixteen Chinese and Western practitioners from the U.S., Canada, Argentina, Taiwan, and Hong Kong shared their cultivation experiences. The conference offered live translation in a dozen languages. 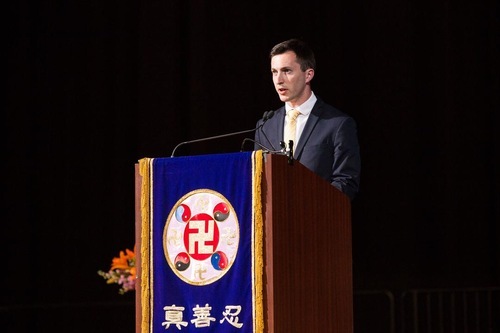 Twenty-eight year old Paul Greaney obtained a Falun Gong flyer four years ago in San Francisco’s Chinatown. When he saw the golden words “Truthfulness-Compassion-Forbearance” on the flyer, he knew that it was what he had been looking for. He found the exercise instruction video and books online, and started the practice himself. Paul quit all his bad habits, and Master Li purified his body. Paul sees the significance of clarifying the truth and saving people, and he has actively joined fellow practitioners in a variety of projects. “It is a serious matter to tell people the truth and what is going to happen,” he said. Falun Dafa practitioners shared their experiences to the conference in attendance. Benjamin Maloney from New York used to be addicted to alcohol and drugs. In 2008, a few months after he was arrested for DWI, a cousin of his introduced Falun Dafa to him, and he started to read Zhuan Falun (the main book of Falun Gong). Ben said that when he started following the principles of Truthfulness-Compassion-Forbearance, his life changed, and he never used drugs or alcohol again. His school grades dramatically improved, and he graduated at the top of his class from a prestigious liberal arts college. After graduating, he received an offer from a “Fortune Global 500” company. Ben is grateful for Dafa and Master, who renewed his life and changed him from being a drunken and lost young soul into a useful adult who makes his parents and himself proud. In his speech, Ben also talked about how he eliminated the attachment to self, broadened his heart, and started seeing things from multiple angles. He believes that it is a manifestation of great compassion if one can see things with a humble and open mind and try to understand other people’s opinions. Lu Di from Boston started practicing in 2005. In 2015, she enlightened that she needed to take the responsibility seriously and clarify the truth to the public. She started several projects which help her inform government officials and community leaders about what Falun Gong really is. She also initiated a long-term project, with help from fellow practitioners, to clarify the truth to the students and faculty at Harvard University. 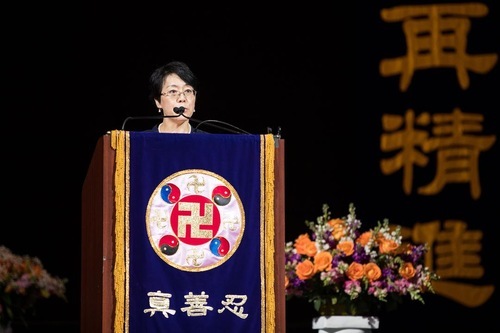 She shared her experience of organising a rally on the Harvard campus, during which numerous media workers, scholars, businessmen, and tourists learned the facts about Falun Gong. She also organised a movie screening to expose the state-sanctioned organ harvesting in China, which was attended by scholars, doctors, human right activists, and Chinese students. “A solid and righteous belief in Master and the Fa is the key to success,” she said in her speech. She said she truly sensed the great power of the Fa. “If you have enough courage to trust the Fa and carry out what you learn from the Fa, you will see the great power. This is also a process for a cultivator to improve,” she added. Roman Balmakov started delivering newspapers for the Epoch Times six years ago. He gets up at 3:30 a.m. every day. Carrying 60 pounds of newspapers, he bicycles ten miles around Manhattan each day, rain or shine. Five days a week, he delivers 5000 copies. He shared a miraculous experience with the audience. One day on his delivery route, Roman felt his soul elevate to the sky. From 40 miles above, his soul saw himself delivering the newspapers. This lasted for 30 minutes. Katherine Combes from Montana shared her experiences of clarifying the truth of Falun Gong to state senators and representatives. Katherine delivers Falun Gong materials to the lawmakers’ offices, and invites them to local Falun Gong events. She also writes to the local newspaper, and holds free workshops to teach the exercises to interested people. She recalled that people used to look at her in a weird way when they didn’t understand what Falun Gong was and why she does what she does. But the situation has changed, and people have now learned that Falun Gong is a great practice. Many people support her. “It is the best reward for me,” she said. Katherine said she hasn’t had any miraculous experiences, but in her heart she knows that she has made a pledge with Master Li: to be a diligent cultivator. Because of this pledge, she has been able to cultivate diligently for many years. She thanked Master for helping her on her journey of cultivation. Li Mengying from Taiwan tries to pass the message of Truthfulness-Compassion-Forbearance to children through animation TV shows. Her productions have since won 56 international awards at all kinds of movie festivals. Many reviewers do not see her work as TV shows for children, but instead believe her work influences the entire society and country. At the conference, Chen Huixia from Canada shared her experiences of eliminating sickness karma and overcoming a life-or-death test by studying the Fa, looking inward for her own attachments, and diligently clarifying the truth. Liang Yan from Hong Kong shared her experiences of clarifying the truth as a media reporter, including how she gains trust from the public. Liu Yuelong from Atlanta described his experiences of memorizing Zhuan Falun and how he eliminated all kinds of attachments during this process. Chen Yingting from Taiwan shared her understanding of collaborating with other practitioners and removing the attachment to oneself. Yang Xiuya from Taiwan shared her stories of clarifying the truth to Chinese people at tourist spots. The conference concluded at 6:00 p.m.